Thanks for all the feedback provided since the release of 3.0 only 6 weeks ago. It was a major update with a lot of changes to absorb. I am pleased to announce 3.1.0 - the next step forward. There are a number of performance improvements and bug fixes. Equipd has also been translated into yet more languages, making it easier for users to understand the interface buttons and labels in their native language. This has been one of the most requested features. Users will be able to add Notes inline with their publication annotations. Just select some text and select the "Note" option in the black menu that appears. Type in your text, and press "Save". The Note will be inserted to the right of the selected content. You can also set the note to "Expand Text" - which means that you will see the text inline, as part of the article! This is so much more than just "adding post-it notes" that sit down the side of the screen. It allows you to add the note right next to the content it relates to. Or to show your comment right inline without having to click anything to see it. Or you can even get creative and use the inline notes to identity point 1, 2 and 3 for example. You may have noticed that the Study Questions were regenerated each time you loaded an article. So if you added annotations to a question it would be missing next time you loaded the content. As of 3.1.0 Equipd will preserve annotations in the study questions. You can now backup your annotations, briefcase, and news items in one step. 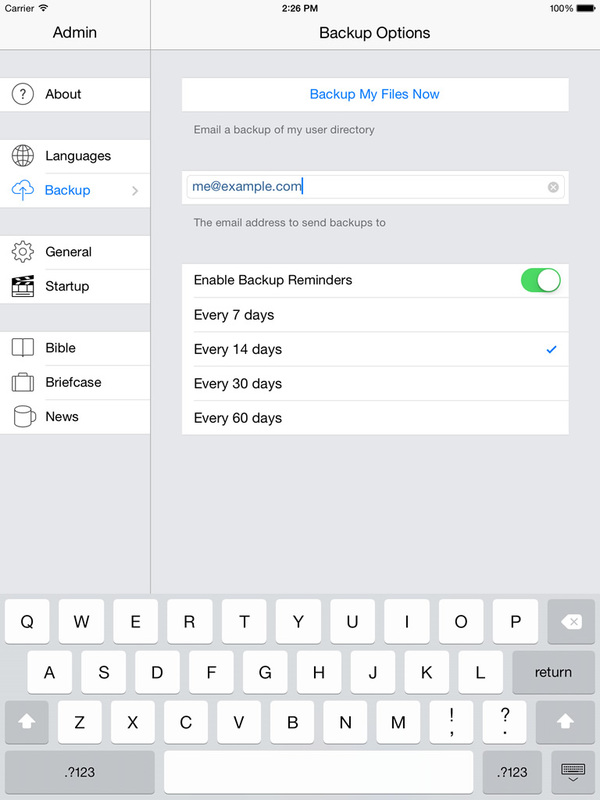 In Admin > Backups you can generate a backup email, and specify reminder settings to prompt you to take a backup frequently. The backup is just a zip file that can be restored directly from the email attachment, or via iTunes. I am pleased to introduce new startup modes to help you get access to content quickly based on how you use Equipd. You can now open Equipd directly to the Favourite Publications section instead of the Today screen. Or iPhone users can tell Equipd to launch into the Today screen for the first time. For users who have had trouble with Equipd 3.0 performing slowly on their device, I strongly recommend you read this article. 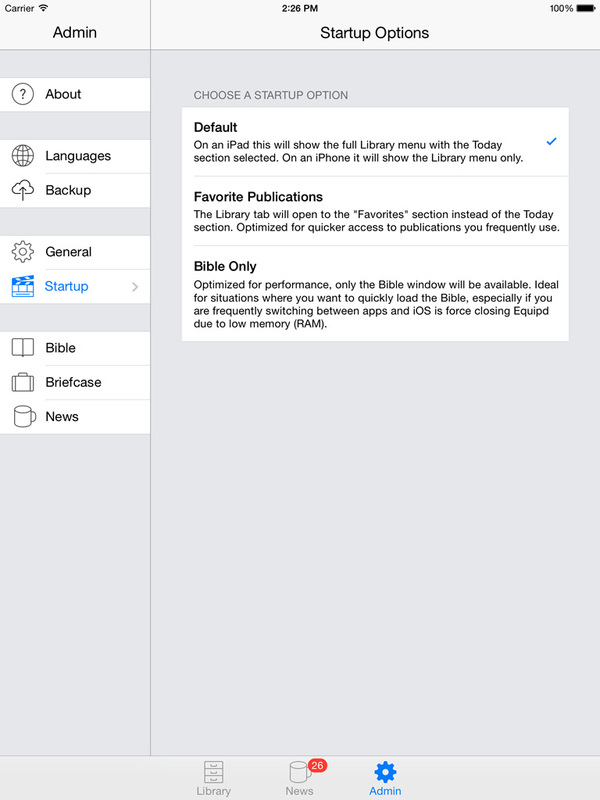 I have also added a new startup mode especially targeted at these users - the "Bible Only" mode. This mode will disable all other screens in Equipd and launch directly into the full-screen Bible. This cuts down on launch time, and also keeps memory (RAM) usage at a minimum so that if you are trying to take Notes and are frequently switching apps Equipd should stay open instead of being closed by iOS - and if it is force closed because of low memory, it will be quicker to launch again. There is now a new Song Picker to make it quicker to select the song at the meeting. It will automatically appear if you open the Song book. If you have come via a direct link to a specific song, it will not auto-appear - but you can access it by clicking the window title bar. Equipd is now translated into Portuguese, Spanish, French, Italian, Danish, Japanese, Russian, German, Dutch, Chinese Simplified/Traditional, Polish, Swedish, Thai. Korean is coming soon. A big thanks to all the brothers and sister for their efforts in translating Equipd into these languages. There are many other tweaks and improvements in Equipd 3.1.0 that you will discover. Equipd 3.1.0 is currently undergoing testing and final tweaks. I am aiming to submit it to Apple before the end of this month.